Your teeth are the first thing that anyone notices when you talk, and there have been sufficient studies that have reinforced the long-standing stereotype – people are attracted to straighter and whiter teeth. As people tend to grow increasingly conscious of their appearance and hygiene, there has been a resurgence in the number of people visiting the dentists to have a complete inspection of their oral hygiene, and further, eliminate any problems that adversely affect their teeth – such as misalignment of teeth. As one of the most effective ways to treat misaligned teeth, Invisalign in Singapore has garnered special attention in recent years. As curiosity around these ‘clear braces’ continues to grow, here we answer the top 10 most frequently asked questions. There seems to be relative confusion as to what actually is Invisalign. An Invisalign treatment entails providing a remedy for misaligned and crooked teeth by wearing a set of clear and removable ‘aligners’ that eventually work to straighten your teeth. Invisalign was actually introduced to rival traditional braces – removing the excessive problems that come with metal brackets, wires, and a load of restrictions. What Are Invisalign Made Of? It is a trademark material which is produced specifically and exclusively for Invisalign. The advantage of this material is that it’s approved by the Food and Drinks Authority (FDA) and is free from any latex or gluten that can cause allergic reactions in some people. Questions regarding the cost of the treatment are most frequent among patients. In the case of Invisalign, it is affordable and not expensive. Find our more about the cost of Invisalign here. For most customers who require Invisalign, the cost falls around the same price as a normal set of braces. However, the true cost of the treatment is dependent on your dentist’s analysis and how many aligners you require. No. Invisalign is very comfortable and doesn’t cause pain to the patient. Particularly when compared with traditional metal braces, Invisalign doesn’t hurt at all. The only cause of pain can be mild soreness initially as the teeth take time to adjust to the aligners. Other than that, another source of discomfort might be the presence of an external component (Invisalign) in your mouth. While patients on traditional braces needed weeks to develop callouses to combat metal-induced sensitivity, Invisalign needs considerably lesser time for your mouth to adapt to it. One thing that patients need to remember when opting for Invisalign is the fact that it constitutes as orthodontic treatment. A little soreness in exchange for straighter teeth and a healthy smile is not a bad deal, right? Unlike traditional braces, Invisalign makes use of the latest technology that maps out the exact surface and movement of your teeth using technology like iTero. This mapping process is done digitally to ensure the aligners are a perfect fit and don’t need the ‘tightening’ associated with braces. Cosmetic dentists that use Invisalign ensure it is designed to enforce the right amount of force at the right place so your teeth are aligned without any discomfort. Can I Eat With My Invisalign Aligners On? The great thing about using Invisalign is that they prove no hurdle when enjoying a visit to your favorite burger joint. For anyone who has worn braces, you may remember the restrictions imposed on the foods you can eat. Invisalign is removable, which means whenever you’re eating, drinking, brushing, or flossing – you can simply remove your aligners. Just make sure to put them back on when done, as the more you wear them, the faster your teeth straighten. Do You Need ‘Attachments’ With Invisalign? No. Not every patient requires attachments when using Invisalign. However, while we’re discussing attachments, some patients do require them (which are small, tooth-colored shape tagged to your teeth) as they provide a ‘handle’ for the aligners. Invisalign needs something to attach to or push on as it attempts to straighten your teeth. Aligners are attached to your teeth, so even if they don’t need regular maintenance and rewiring – you would be wise to do your due diligence to keep them clean. Experts recommend cleaning them using a toothbrush and toothpaste, gently. To wash the aligners, make sure you only use lukewarm water. It is important to note that never use hot water as it could permanently disfigure your aligners. In addition to maintenance, food and drink residue can cause aligners to stain. This is why dental hygiene experts advise brushing after every meal, particularly when you have aligners on. Lastly, when asking about maintenance, patients often question if the aligners need to be sterilised if they are dropped somewhere. As they are to be fitted in your mouth, ensuring maximum cleanliness is imperative. Using hot water for sterilization can prove very costly, so avoid using hot water for sterilization. For cleanliness, Invisalign offers its own ‘Cleaning Crystals’ that will clean your aligners and eliminate any impurity that can harm you once you put them on. In addition to bacteria elimination, Invisalign Cleaning Crystals can even remove plaque in 20 minutes to give you clean and neat aligners. 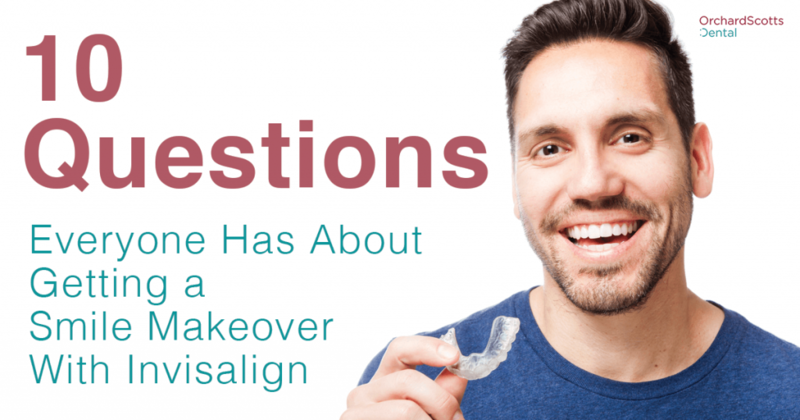 Do Aligners Need To Be Changed Regularly? Not necessarily. Once you approve of the process, your dentist will map your teeth to formulate the creation of your unique aligners. You may be required to wear your set of aligners for 20 to 22 hours a day for the recommended period of time, for a particular set. For maximum effectiveness and to ensure the teeth-straightening process continues, aligners may need to be changed. However, the frequency depends on your dentist’s assessment of the efficacy of the current set and your predetermined goals. A new set is appointed in line with the progress you’ve made. Each new aligner will smoothly and progressively shift your teeth back in place, until you reach your beautiful new smile. What If I Break My Invisalign Braces? Invisalign is not easily breakable, so rest assured that routine usage would not harm the structural strength of the aligners. However, if you do find yourself in a situation where you have broken your aligners, make sure to contact your cosmetic dental clinic ASAP. Only the dentist you work with will know about your current progress and will be in a better position to advise whether you should wear a previously used set of aligners, go for the next set of aligners or just simply order a new one. Invisalign utilizes modern technology to provide you with a teeth straightening solution that is more effective and less painful than other competing products. If you have any more questions, feel free to contact Orchard Scotts Dental.